Here’s something a lot of people don’t know about me: I love bathtubs. The clawfoot, the European wraparound, the whirlpool, the freestanding–you name it, and I’ll soak in it. I especially love a bathtub plopped right in the middle of this gorgeous marble bathroom in an exquisite 5-star resort on the Gulf of Thailand. There’s even a few bottles of organic bubble bath on the counter for me to try. I simply can’t wait to take a long, hot bubble bath tonight. Before we get there, though, a little bit about where we are: we have just arrived at the elegant Dusit Thani Hua Hin resort. Frequently ranked amongst the world’s most glamorous resorts, Dusit Thani Hua Hin consistently wins luxury hotel awards and recognitions and is often cited as one of the most prestigious hospitality companies in the world. Their resorts are spread throughout Thailand and much of Asia, with locations in the United Arab Emirates, the Maldives, India, China, and the Philippines. And though I never imagined I’d had the chance to stay in such an exquisite place, here I am, the ever-present budgeteer, staying in one of the nicest rooms in the entire resort. I’ve thrown my bags all over the two rooms, taking up as much space as I possibly can (because why not? ), checked out the living room, bathroom, and walk-in closet, and now I’m standing on the terrace munching on a dragon fruit the staff has left in a complimentary fruit basket on the kitchen table. I’ve got fifteen minutes before I need to be back in the reception for dinner, so I’m taking a much-needed moment to myself to watch the sun fall over the gulf, enjoy this piece of sweet fruit, and uncloud my mind from everything we’ve seen and done so far this week. Hua Hin is the smallest city we’ve visited on this trip, as we’ve spent the rest of our time in Bangkok and Chiang Mai. Considered by many Thais to be Thailand’s first beach resort (who needs Phuket? ), Hua Hin is a famed hotspot for local Thais and their families and in recent years has found new popularity with foreign tourists as well. 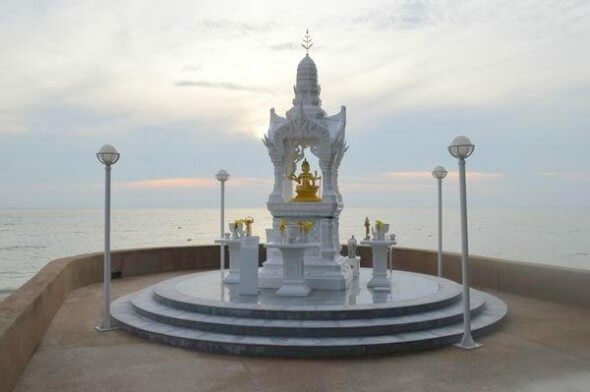 As a destination, Hua Hin has an unusual history, especially in terms of its evolution from fishing village to destination vacation hotspot: the city traces its modern history to the 1920s when the Royal Thai family decided to buy beachfront property here and build a summer home to escape the gripping humidity and sweltering heat of Bangkok in the summer months. (Because Hua Hin is only two and a half hours from the country’s capital city, it seemed like the perfect alternative to the islands in the southern regions). The most famous summer palace built during Rama’s reign in the 1920s–Phra Ratchawang Klai Kangwon, which roughly translates to the “Far from Worries Palace,” which I love–remains the royal family sojourn and the home-away-from-home for all Thai royalty. So, as you can imagine, where the royal family goes, the Thais want to be, too. In the 1980s and 1990s, luxury hotel groups started popping up along Hua Hin’s coast, and international tourism in this small city was born. Foreign visitors began gracing the area and supporting local business and tourism endeavors, and now, what was once a sleepy fishing village is now a bustling city synonymous with its beaches, night markets, rocky shorelines, excellent fishing, and national parks, mountains, waterfalls, caves, Buddhist temples, and other historical sites. It’s also the home to many wealthy expats, Thai and foreign retirees, and the place where many middle-class and high-society Thais spend their weekends. I am none of these people, and yet, I’m here, too. And I couldn’t be happier–Hua Hin is gorgeous. The Dusit Thani sits right on the coast of the Gulf of Thailand, and my room is spectacular. It’s not even a room, really, but a two-roomed suite. Even though I’m by myself, I’ve been given one of the Club Suite rooms for the night, a premium accommodation option with a bedroom (with two king-sized beds in it), full living room, private glass terrace, kitchen and dining area, and stunning marble bathroom larger than my bedroom at home that includes twin sinks, a rain shower, and that temptress of a clawfoot bathtub. At the time of this article’s publication, the Club Suite starts at 8,250 baht (roughly $265 USD) for weeknight stays and 8,700 baht ($289 USD) for weekends. However, because Dusit Thani has such a wide variety of accommodation options, there are a range of price points to consider: travelers can stay in the Superior room for as low as 4,200 baht ($135 USD) a night or reserve the entire Presidential Suite for around 34,200 baht ($1,200 USD), depending on the season. (Keep in mind, of course, that the Presidential Suite can easily accommodate eight guests and consists of a master bedroom, second bedroom, living room, dining room, and a private terrace—all with views overlooking the Gulf of Thailand. But I digress. Back to meeting my small group in the reception for the exciting surprise that the Dusit Thani staff has waiting for us. We’re greeted with a sunny cocktail and are told that we’re going to be doing something a little special before dinner. A woman leads us through the hotel downstairs to the staff kitchen, where she tells us to please enter through the steel doors and enjoy the special delights that their award-winning sous chef, a newly hired chef all the way from Italy, and his superb staff, have prepared just for us. My jaw drops as we enter the kitchen. There are chilled bottles of champagne in a three-foot tall intricately designed ice sculpture, tables and tables of tiny spoons of decadent Thai-inspired dishes and large fruits carved into the most delicate designs. There’s a woman making Thai crepes at the end of the table, and she invites us to come and try our hands at the art of crepe-making. 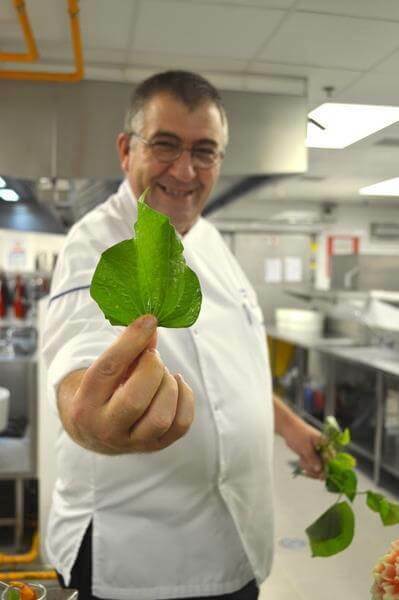 The sous chef introduces himself (see his portrait below), and we’re told to please eat as much as we can. There are new recipes, time-tested recipes, fusion recipes, and traditional Thai recipes. Because everything is bite-sized, we are encouraged to try at least one of everything. That is not a very difficult request to fulfill. The rest of our night is delightful–we have a very light dinner and take taxis out to Plearn Wan Night Market, a contemporary Thai night market modeled after one from the 1960s. The two-story open-air wooden platform complex is strung up with blinking lights, old gas station pumps, statues of 1960s pop culture and cartoon icons, and soft 1960s Thai music playing from loudspeakers. 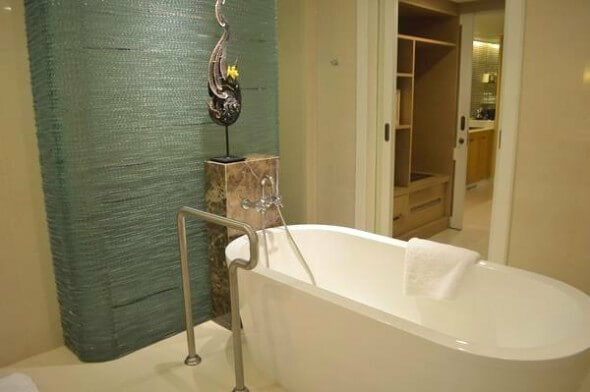 When we finally return to the Dusit Thani late that night, I am more than ready to fill the tub and take a long, hot bath. My very long bubble bath that night was perfect. 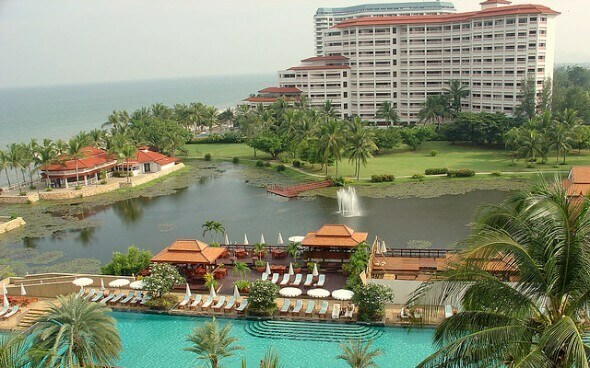 Hua Hin is about 2.5 hours by car from Bangkok’s Suvarnabhumi International Airport. If traveling on your own, take the Expressway to Highway No. 35 (Thon Buri-Pak Tho) (you’ll pass both Samut Sakhon and Samut Songkhram provinces). In about 100 km, turn left at the junction to Highway No. 4 and follow Petckasem Road to Dusit Thani Hua Hin. Compare prices online at Hotels.com, Priceline or Travelocity. Fabulous review of this fantastic 5 Star hotel. 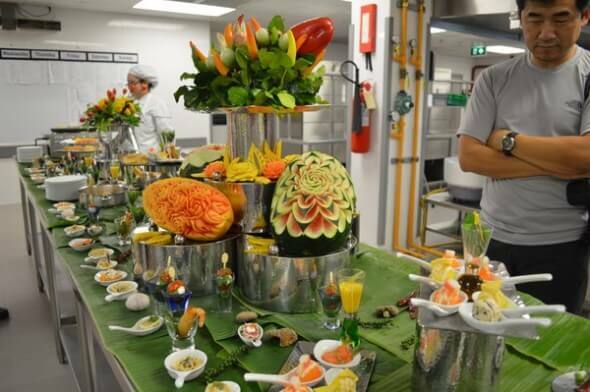 I’d love to wander through that kitchen sampling everything! And, what exactly is adragon fruit? I’ll look that one up. Again, another fine review. Thanks, Ken! Ohh, a dragon fruit! See here: http://en.wikipedia.org/wiki/Pitaya They are the craziest-looking fruits, but are so delicious!